If you’re a mom with young kids (or if you otherwise have young kids in your life), you know that they’re quickly bored with the new toys they receive for Christmas. Rather than cluttering your home with new things for them to play with—and your spirit with frustration—try these zero-clutter ways to entertain young kids this winter. 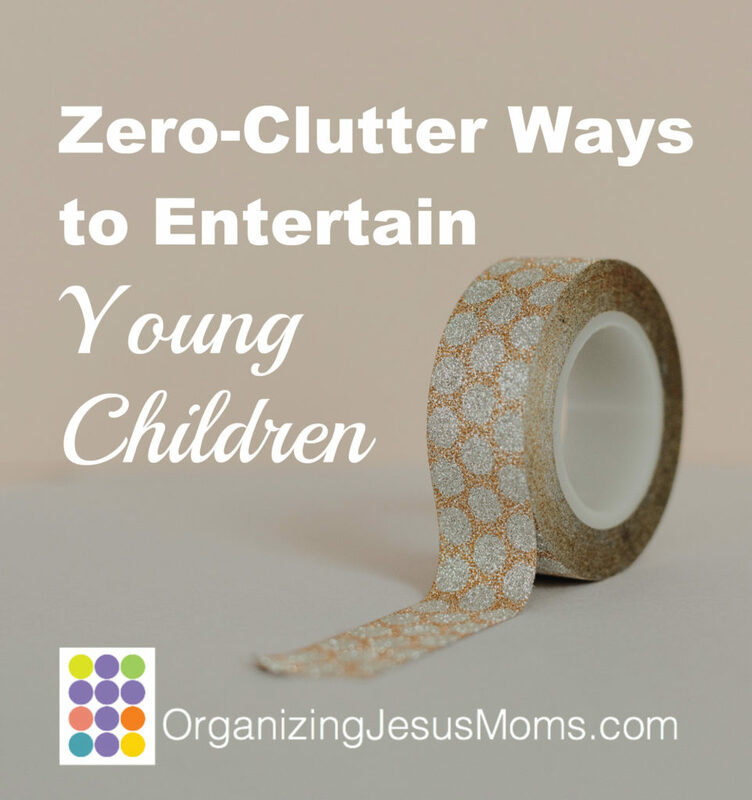 Ideas like this help to teach kids to enjoy their current blessings instead of waiting for more… and you’d never guess that so many of the things around your house could be so much fun! Bathtub Grab a few bucketfuls of snow and let the kids play indoors. Bringing snow into your bathtub is far easier than getting everyone suited up for the weather (and thawing everyone out afterward). My friend Jen also swears by shaving cream in the tub—she says a little food coloring adds interest, and by the time her boys were done, the tub was clean and so were they! Masking or washi tape Placing masking tape lines on your carpet is a quick, easy way to make roads for matchbox cars, pens for stuffed or plastic animals, targets for balls, a tightrope to walk—anything really. Challenge your kids to blow a ping-pong ball along a tape line, or balance one on a spoon and walk the line. Laundry baskets Laundry baskets are fabulous toys. A sideways laundry basket can be a soccer goal. Sitting on a chair, a laundry basket is a great basketball “hoop.” Tied together, they can be a train for stuffed animals. One upside down on top of another is a cool rocket ship. Tongs Kitchen tongs are fun for all sorts of grabbing around the house. After they get tired of general grabbing, try giving them a bunch of small objects (like Duplos, blocks, or plastic figurines) and a muffin tin to fill. Slightly older kids can use tongs to sort Legos by color or shape. Cookie Cutters While actually making cookies is hard to beat, you can use also cookie cutters for play clay. Your kids can trace around them with crayons or markers and then color in their shapes. For littler ones, you can trace around them and then have them match the cookie cutters to the shapes, like a puzzle. Paper cups Bounce a ping-pong ball and try to catch it with a paper cup. Or poke string through the bottoms to make an old-fashioned “telephone”, holding the string tight to see if you really can hear through it! (We’ve had varying degrees of success with this, but it’s still fun.) Freeze your favorite action figures knee deep in a ice cube tray, then let your kids slide them across the kitchen floor—they really fly! Keep a towel handy and think of it as an extra cleaning for the floor. Flashlights In a winter-dark room, flashlights can be endlessly fascinating. Try “I spy” and give hints for something they can find with the flashlight. Ask them to shine on parts of your body (or theirs, trickier!). Shine on colors (can you find something red?) or shapes (can you find a square?). Hide an object and have them search for it with the flashlight! Big Bowl A large bowl (plastic or metal) is a great target for small balls or bean bags. It could be a drum or a hat (or both, but watch out for headaches). Fill a large kitchen bowl with water for fun washing dolls, rocks, or coins. Two bowls and a big spoon are cool for transferring ice, beans, or uncooked macaroni back and forth, back and forth! What around your home could you use to entertain your children on a chilly day? Be creative, and have fun! For more on organizing for the kids in your life and reducing the clutter in your home, check out my book, Building Your House: A Faithful Mom’s Guide to Organizing Home and Family.